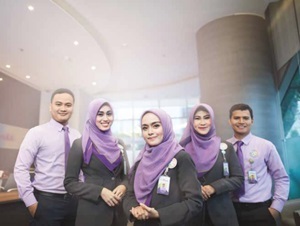 PT Bank Muamalat Indonesia Tbk - BMI or referred to as "Bank Muamalat" is a well-established sharia bank in Indonesia which operates based on the Islamic principles. Formed in 1991, Bank Muamalat is recognized as the pioneer in sharia banking industry in Indonesia. Bank Muamalat was formed based on the initiative of the Indonesian Council of Ulamas or Majelis Ulama Indonesia (MUI). In 1992, the Bank started its commercial operations in 1992. Later in 1994, Bank Muamalat obtained license as the Exchange Bank. Based in Jakarta, Bank Muamalat offer services through 83 branch offices, 202 sub branch offices, and 78 cash offices spread in all over Indonesia. Bank Muamalat also has 1 overseas branch office at Kuala Lumpur Malaysia. As of September 2017, PT Bank Muamalat Indonesia Tbk is 32.74% owned by Islamic Development Bank, 22.00% by Boubyan Bank, 17.91% by Atwill Holdings Limited, 8.45% by National Bank of Kuwait, 3.48% by IDF Investment Foundation, 2.84% by BMF Holdings Limited, 1.67% by Reza Rhenaldi Syaiful, 1.67% by Dewi Monita, 1.66% by Andre Mirza Hartawan, 1.39% by KOPKAPINDO and 6.19% by general public. The financial performance of Bank Muamalat in 2016 showed a good improvement. According to PT Bank Muamalat Indonesia Tbk Annual Report 2016 as cited by JobsCDC.com, Bank Muamalat managed to record total profit before tax of Rp116.46 billion in 2016, an increase of 6.93% from the previous year of Rp108.92 billion. Total net income amounted to Rp 81 billion in 2016, which represented an increase of 9.45% over total net income recorded in 2015 of Rp 74 billion. Bachelor or Master degree (S1/S2 from reputable university, preferably from (Islamic) Economics, Accounting, Engineering, Information System, Mathematics, Science, Statistics or Psychology major. Have an outstanding academic record with minimum GPA 3.00 (for Bachelor degree) or 3.25 (for Master degree) within 4.00 scale. Maximum age of 25 years old (for Bachelor degree) or 27 years old (for Master degree). Have TOEFL/IELTS/TOEIC score minimum 500/6/550. JobsCDC.com now available on android device. Download now on Google Play here. Please be aware of recruitment fraud. The entire stage of this selection process is free of charge. Bank Muamalat - Officer Development Program Futere Leader Muamalat February 2018 will never ask for fees or upfront payments for any purposes during the recruitment process such as transportation and accommodation.